On the 29 of November, Yann Le Mouël Auctioneers will have the privilege of selling the wine collection of the internationally acclaimed violoncellist and Orchestra Director Mstislav Rostropovich. Over 1 200 bottles of wine valued at close to €300,000 will be auctioned. Mstislav Rostropovich (1927-2007) was without a doubt, one of the most important figures of the classical music scene of the 20th century. Aside from their successful carriers, Rostropovich and his wife, the soprano Galina Vishnevskaya, diva of the Bolshoi Theater, also put together two important collections – Art works and wine – both of them a reflection of their image as a couple of epicureans who strongly defended their cultural freedom. Their vast Art collection was acquired in 2011 by a Russian art collector. « We remember our parents as a couple full of curiosity, enjoying life and happy to discover the gastronomy and traditions of the countries where they were called to perform. Our father, loved particularly the wonders offered by the “French Terroir”, and constituted over time a cellar where he could find the wines he loved. For him as well as for our mother, this collection had to be kept in France, country that had welcomed us during our exile, and from where the majority of the wines that composed it originated », have expressed Elena and Olga Rostropovich, daughters of the collectors. 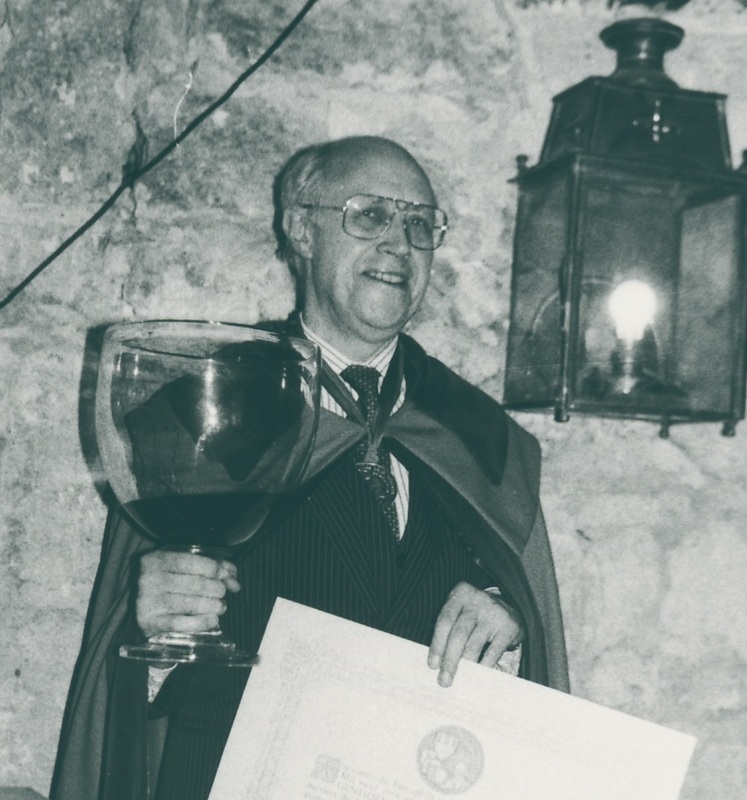 While creating his cellar, Mstislav Rostropovich chose to honor the most memorable events that marked his life and that of his family. Thus to the wines of 1927 to commemorate his birth, he added those of 1926, the year when his wife Galina Vishnevskaya was born, his wedding in 1955, the birth of their daughters, Olga in 1956 and Elena in 1958. The achievements of their musical careers are also represented by the choice of vintages that constitute the collection. Their exile at the United States in 1974, the concert he gave on November 11 1989 at the Berlin wall. The renaissance of Russia is also present in the choice of vintages that constitute his collection. It is certainly not a coincidence, if the years that pass have hide in a corner of our cellars this bottle of the 1955 vintage. They intended that the opportunity be given us to dust it off sothat, this evening, our friends of the brotherhood, be able to offer it to you, to remind you of an occasion cherished by both of you. The Domaine , by my intermediation, would also like that this bottle of GRANDS ECHEZEAUX 1955, give witness to the profound admiration on towards you that it carries and that when you drink it together, our hope is that it brings you some extent of the sublime happiness that you have, with such generosity, given us for so many years and in such numerous occasions. The great Bordeaux represented by Lafite and Latour and many others classics, are part his collection. 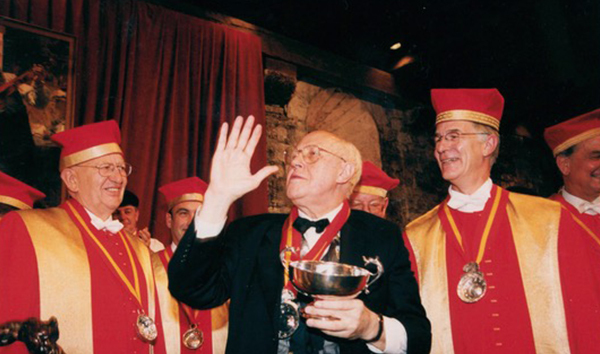 His love of Burgundy is shown by presence of wines from Henri Jayer, Georges Mugneret and René Engel, of the Hospices de Beaune and Hospices de Nuits St. Georges as well. As he was also close to a certain number of Champaign producers, many a great bottle of Pommery, Krug and Moët & Chandon amongst others, are to be found in the catalogue. A certain number of foreign wines from Argentina Italy and Spain give witness to his cultural curiosity and some carefully selected Armagnacs and Cognacs round up the collection. 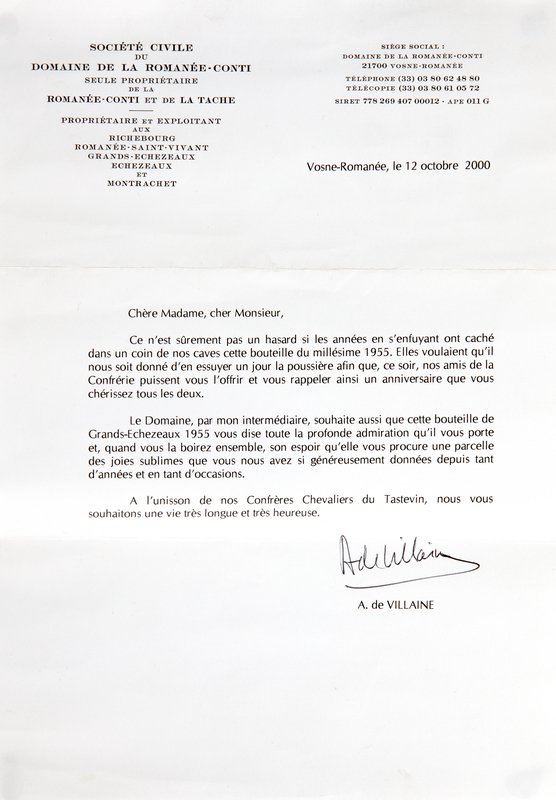 Gift of the domaine specially created for Galina and « Slava » Rostropovich. It is numbered 1410 and signed by Patrick Berthaud.